9:00 PM EDT on Thursday June 19th, 2014! Ahhhh it’s that time of year again! The flowers are blooming, the sun is shining, the birds are singing, and Google is holding its annual I/O conference! The conference runs next week starting on June 25th, and we’ll all have our eyes glued to the tech news sites to see what is announced. 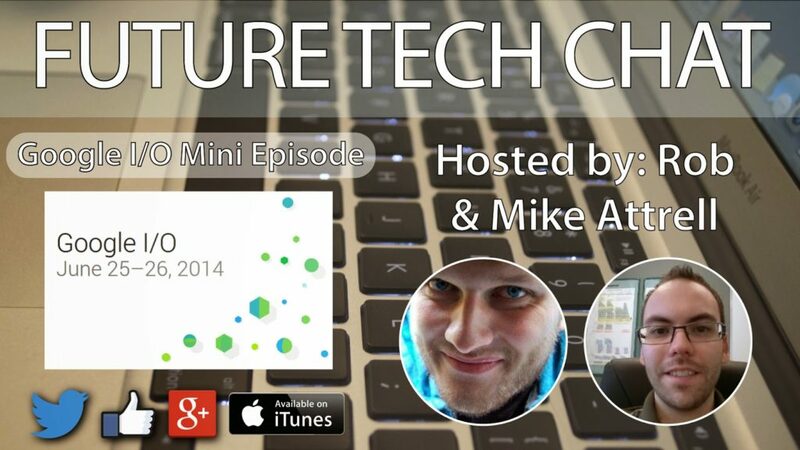 This week’s Future Tech Chat mini-episode will feature +Rob Attrell and myself, along with special guests +Carolyn Higman and +Ross May! These types of corporate events are greatly anticipated forums for product releases and company developments, and it is a time-honoured tradition to make predictions and wish lists of what we’d like to see come out of them. In this week’s special edition mini-episode, we will be sharing these predictions and thoughts with each other and all of you! The ball is in Google’s court, let’s keep our fingers crossed for a slam dunk! I hope you’ll tune in live at our special mid-week time slot of 9:00 PM EDT on Thursday, June 19th for the episode, and you’ll be able to watch it in full below live or after it’s aired. As usual, you can ask us any questions you might have on the Q&A in the event page (https://plus.google.com/events/ckl1neak16gksfkmkgudn1ne6g8), or by email at [email protected]. So far we have answered or addressed every question submitted, and you can expect that trend to continue! We look forward to seeing you there live on Thursday!